N-Body will be released at 4 pm EST today. Features of this release include an improved dwarf galaxy model and new data representation features. Post here with issues. As this is likely my last release on this project (due to my move to England for graduate school), I would like to thank all of you for helping me do great science during my time affiliated with Dr. Newberg's group. I will still be active in the community, but I am proud to hand my role in the project off to Sidd. 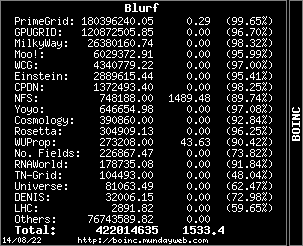 I look forward to a continued relationship with the BOINC community in the future. Message 62115 - Posted: 5 Aug 2014, 18:56:19 UTC - in response to Message 62111. Best wishes on your future Jake! Good Luck to you Jake!! Ok, each of the N bodies that I have run has ended Inconclusive (1 error). This is not normally a big deal except I noticed that they have yet to be sent to other crunchers for validation? Is there something that is keeping these units from being dispatched? Message 62131 - Posted: 7 Aug 2014, 21:07:01 UTC - in response to Message 62129. Thank you for your reply. I have noticed a slow validation process so far. However, keep in mind that on 1 core, these simulations take half a day to run. It is conceivable that there has not been enough time for validation to occur. I will be monitoring this closely and provide more information later. Message 62133 - Posted: 7 Aug 2014, 21:18:47 UTC - in response to Message 62131. The error experienced has been found by 4 other crunchers; see the following text. Is this due to a bug? Message 62135 - Posted: 7 Aug 2014, 22:08:06 UTC - in response to Message 62134. The histogram files were updated. Anything dated before 08_06 will definitely error. This is what is being seen. Abort these workunits if you see them. Only ones with 08_05 in them should be valid. Apologies for the inconvenience, but the development team saw no other way. I'm also having a unusual amount of errors. My new computer (3 months) works now absolutely reliable, up till now, no error can be assigned to a heat related problem or other pure calculation errors. Das System kann das angegebene Laufwerk nicht finden. (translated: The system cannot find the drive specified). Besides: What does "Only ones with 08_05 in them..." mean? Where can this data(08_05 or 08_06) be found? Message 62147 - Posted: 10 Aug 2014, 16:46:08 UTC - in response to Message 62146.
will be in the name of the workunit. This simply refers to the date that the run was started. You should stop seeing these errors very soon. Yep, just checked: All my errant tasks contain 06_11 or 06_03 or 06_28 in it's name; valid tasks all have 08_05 in it's name! Completely confirms your remarks. Gotta stop two of the remaining three tasks, since those are non-08_05-types. By the way: Is it possible to stop those task on all affected users by milkyway itself by some sort of remote-kill-call? Problem is: one of the affected tasks that i have will run an estimated roughly 42 hours (has already run for 1 1/2 hours, which is no big deal, with progress just getting to 3,5%). There will be a ton of users who will run these sometimes ultra long tasks getting an error right at the end of the run. Might be frustrating for those users. Perhaps a report on Milkway-main-page might be helpful too. Message 62149 - Posted: 10 Aug 2014, 19:02:08 UTC - in response to Message 62148. I'm a slave to this project. It's not a problem to work Sundays at all! Please post to the MilkyWay main page. Truth-be-told, I am the worst person to ask about server operations. Travis is probably your best bet. The runs in question have been stopped so this is only a temporary issue. It turns out that for this application, time estimation is extremely difficult. N-body simulations are notorious for this. I believe the last person to work on this in our group was Jeff. There are no actual 42 hour workunits to my knowledge, and if there are, appropriate credit should be awarded. Like I said, this should be resolved as the queue is cleared of these old workunits in the coming week. I apologize for this. But maybe someone else will be able to make something of your suggestion. Definitely try posting on the main page. P.S. I'll think I'll have that cold beer now. 3rd: The "All my wingmen on Linux" problem example. This unit had too many (4) ERRORs similar to "Cannot find library CLIB-v2.4" ... and one more type of error I can't remember at all, I am sorry. This unit also have had two *correct* scientific results with "Poor likelihood - returning worst case"). However, it could not be validated, because of too many errors. That's all I have seen and could find for now. List of errors from "MilkyWay@Home N-Body Simulation v1.42 (mt)" on Linux and Darwin (Mac OS 10.8.5 build 12F45 and Mac OS 10.9.4 build 13E28). atos cannot load symbols for the file milkyway_nbody_1.42_x86_64-apple-darwin__mt for architecture x86_64. Message 62193 - Posted: 17 Aug 2014, 22:43:35 UTC - in response to Message 62192. I will look into this. It looks like a library issue. We tried something different this time around. I will suggest that revert back to the previous way of doing things to avoid this error. Message 62195 - Posted: 18 Aug 2014, 6:37:14 UTC - in response to Message 62193. Thank You so much, Jake! Good luck in the U.K. And have fun! Message 62203 - Posted: 19 Aug 2014, 3:32:49 UTC - in response to Message 62195. Thanks! In response to your earlier point, we have confirmed that this is a library issue. This should be fixed upon the next release (I want to say a couple weeks from now, but don't quote me).